Zakk Air in-Ear Bluetooth is Highly aesthetic Earphone made up of quality material. It is featuring all the best possible feature under the given price segment. This gadget comes with a soft rubber finish and silicone earbuds that you can tirelessly wear for a long time. Secure hooks which are going to be attached with the ear will ensure that the wireless headphones stay in place during any sports exercise. let's find out more about this amazing product. It is specially designed and developed for the athletes offering a sweatproof/ rainproof body. The material used to manufacture this earphone is pro-grade and durable as well. It can be your best partner for workouts. It is very light with a weight of 15 grams. the simple yet stylish design is best used for all long hours of music play. 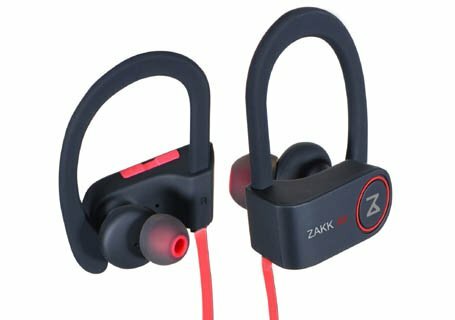 This Zakk Earphone is powered by Bluetooth 4.1 technology & ActiveX Sound chipset offering a stable signal transmission and crisper sound with quality bass (enjoy liquid TREBLE &solid BASS). ActiveX Sound chipset also ensures low power consumption. Its IPX7 Water resistant body protects earbuds from sweats during athletic activities. It has soft gel earbuds providing secure fit along with pure comfort with no compromise on music experience. It also featuring noise cancellation, full call control, complete mobile device compatibility with expandable foam ear tips. You can do your exercises without bothering about the ambient noises because of CVC 6.0 Active Noise Cancelling technology along with distortion isolating fit. Here manage your personal listening experience with ease with a touch of a button (Volume, tracks). It has built-in rechargeable long-lasting lithium battery provides up to 180hrs of standby time and 8 hours of music play. If you are interested you can check the current price.